Want to be notified of new releases in xiaoxiaoflood/firefox-scripts? 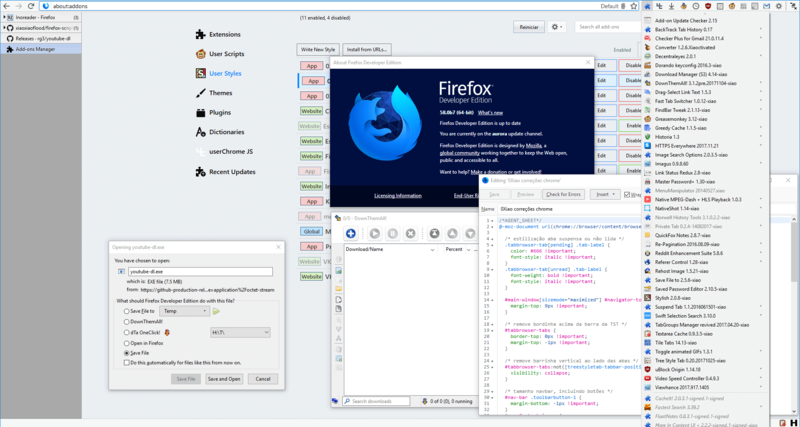 Just for Firefox Developer Edition (main compatibility target), Firefox Nightly and Firefox ESR. It will not work on Firefox release/stable or Firefox Beta. 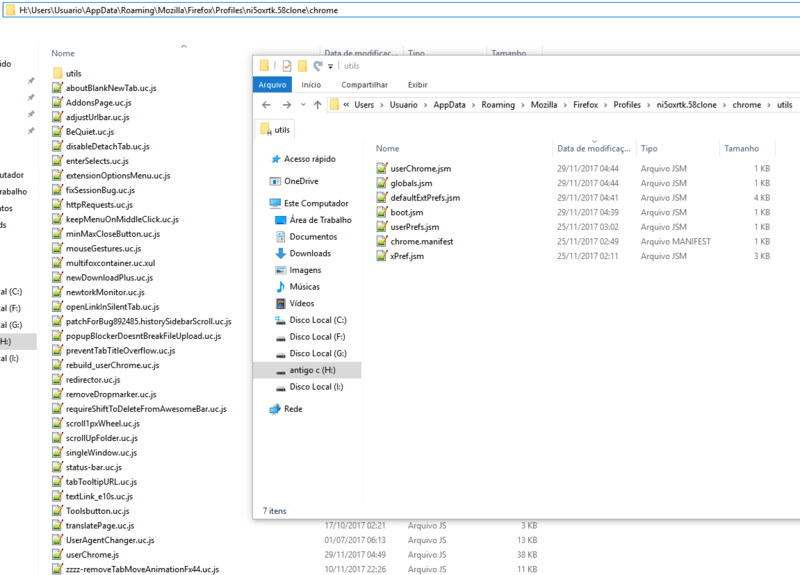 Save config.js to Firefox installation folder (usually C:\Program Files (x86)\Mozilla Firefox), next to firefox.exe. Save config-prefs.js into \defaults\pref inside Firefox installation folder (usually C:\Program Files (x86)\Mozilla Firefox\defaults\pref), next to channel-prefs.js. Click Firefox menu button (☰) -> Help -> Troubleshooting information (or simply open the address "about:support"), then click Open folder. This is the folder of your Firefox profile. In there, create a new folder called chrome. 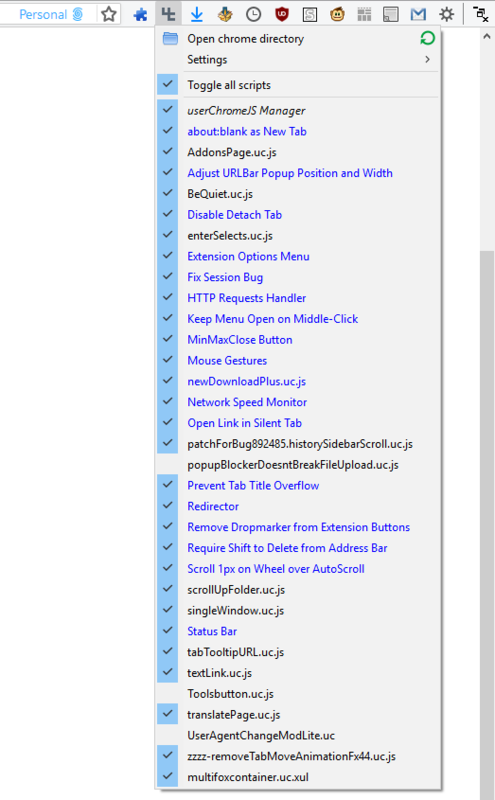 Inside chrome, create another new folder called utils, then save all these files into it. Save the desired userChromeJS scripts into chrome. Read below the description of each one. Adjust URLBar Popup Position and Width In Fx 48, URLBar Popup was stretched to fill the entire width of the browser. This script restores the previous behavior, with the popup inheriting the width and position of URLBar. Note: there are similar userChrome.css alternatives, but the URLBar width can change depending on the buttons around and depending on the size of the window. You can't set dynamic width with pure CSS, so JS is needed. Master Password+ Locks Firefox with password. It will prompt the password on browser startup or anytime when you lock it with Ctrl+Alt+Shift+W. You need to set a master password in Firefox Options > Privacy & Security > [×] Use a master password.